Feb. 24, 2012 4:00 p.m. 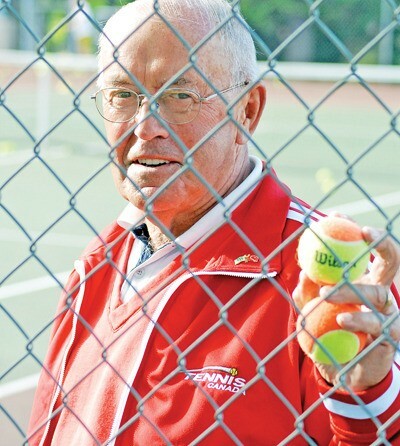 Longtime local tennis instructor/mentor Gordon Verge heads into the new season as one of the top-ranked players in the country in his age group. Local masters tennis player Gordon ‘Raquetman’ Verge won seven of the 11 sanctioned events he entered last year, and his stellar results have earned him some notable rankings. Verge is currently ranked number one in B.C. in singles and number two in doubles in his age group (Men’s 75-79) as a result of winning both events at the Provincials last summer in Vancouver. The Canadian National rankings have him listed as fifth in singles and first in doubles, having won the National Doubles Championships with his partner Bob Seeley for two years straight. Having been selected by Tennis Canada for the seventh year in a row (and third as captain) to represent the red and white at the World Team Championships, followed by the World Individuals, the International Tennis Federation, based out of London, currently has him ranked 65th in the world in singles 10th in team doubles. Verge’s first tournament of the new season will be the Western Canadian Nationals slated for March 21-25 in Richmond, B.C.